Indonesian search and rescue officers and military personnel look for victims of a landslide at the Muka Payung village in Cililin, Bandung on March 25, 2013. More than half of Indonesia's population live in areas at risk of landslides, an official said Thursday, with traditional farming methods blamed for the widespread vulnerability. More than half of Indonesia's population live in areas at risk of landslides, an official said Thursday, with traditional farming methods blamed for the widespread vulnerability. Some 124 million Indonesians out of a population of around 240 million live in "moderate- to high-risk landslide areas", National Disaster Management Agency (BNPB) official Sutopo Purwo Nugroho said, citing a study. 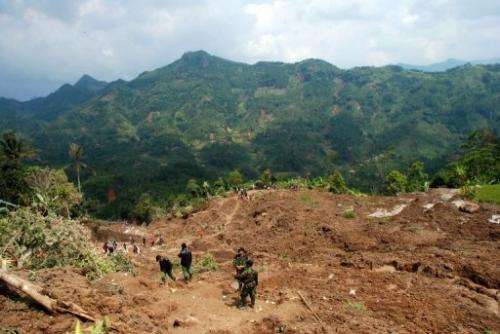 "Population growth and greater volume of rain as a result of climate change have increased the potential for landslides, but the most dominant factor is land degradation from farming activities," Nugroho told AFP. Twelve people were killed and five are still missing after torrential seasonal rain triggered a landslide in western Java on Monday. The 2012 study carried out by the BNPB, the Central Statistics Agency and the United Nations Population Fund found there was a high incidence of landslides on the steep slopes of the densely populated island of Java. "Industries also clear forest for factories. With an expected increase in rain, especially during the wet season, we will likely see more landslides in the future. This is a serious problem," Nugroho said. 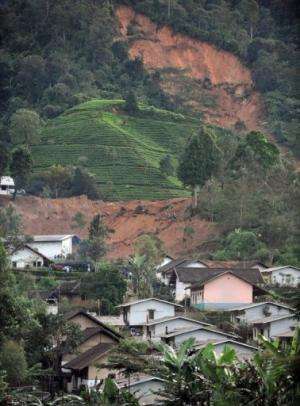 Houses in Dewata village, West Java lie buried under earth after a landslide in February 24, 2010. Some 124 million Indonesians out of a population of around 240 million live in "moderate- to high-risk landslide areas", National Disaster Management Agency (BNPB) official Sutopo Purwo Nugroho said, citing a study. Deforestation and land degradation that alters tree-root systems is a major trigger of shallow landslides, common in Indonesia, where flooding and frequent earthquakes contribute to soil instability. There have been 58 landslides in Indonesia this year, which left 107 people dead or missing.